In September of 2014 the Japanese Culinary Arts Network (JCAN) brought three master knife craftsmen to the United States for an unprecedented tour demonstrating traditional Japanese knife making. It was a great experience and a true rarity to see these time-honored knife making methods in the United States. The tour included forging and engraving in locales across the U.S., kicking off in Princeton NJ on September 11, Then on to Brooklyn, Atlanta, Chicago and finishing in California. 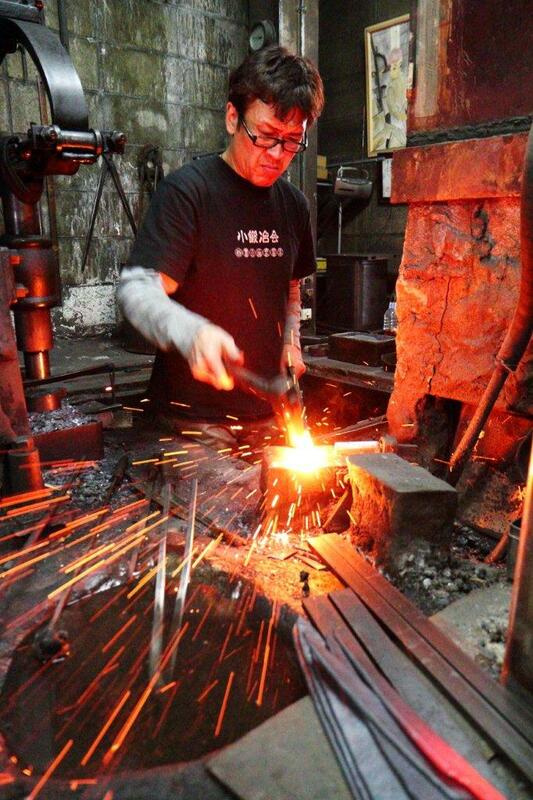 The traditional process of forging steel into knives dates back over 1,000 years in Japan. These methods are still practiced today by a handful of skilled craftsmen using artisan methods to produce blades by hand that are some of the best in the world. JCAN is pleased to share this traditional craft to the U.S. and to introduce the public to the process involved in this fascinating art form. Mr. Tadashi Enami is a second generation forging master from Sakai city. He has 28 years of forging master status and he specializes in Wakashizuke, a forging technique which combines two kinds of soft and hard metal to create a superior blade. He was designated a traditional crafts-person in 1997 by the Japanese Minister of Economy, Trade and Industry. This designation is given to select expert craftsmen involved in traditional arts. Mr. Akimasa Oe is a second generation knife assembling and finishing master from Sakai city. After graduating from university in Osaka, he apprenticed and worked in other aspects of the knife industry in Japan before returning to take over his father’s business. He now has over 25 years of experience as an assembling and engraving master. He notes that the most difficult part when engraving in English is writing the letter O or R. These round letters are the most challenging, as these shapes do not appear in in the Japanese alphabet. hundred knives and scissors for both home and professional use.